Give your 2007-09 Porsche 997 GT3 or GT3RS a super aggressive CUP Car sound and shave 36lbs off your Porsche by replacing the heavy and restrictive OEM Side Mufflers for better sound and weight reduction. Using these Fabspeed 997 GT3 Muffler Bypass Pipes essentially eliminates a Fabspeed Maxflo Exhaust system. It is the most aggressive type of exhaust available and is perfect to turn your Porsche 997 GT3 in to a full on race machine. They are machined from stainless steel and a direct bolt on, meaning a quick and easy installation. 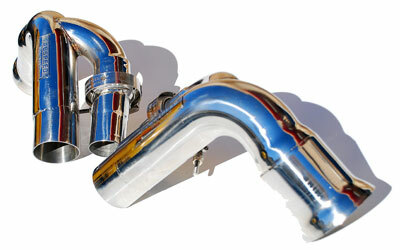 These bypass pipes gives your 997 GT3 a toned race sound, while still staying within legal sound levels. 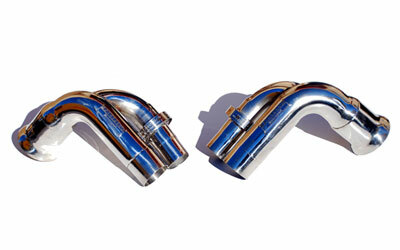 Unleash even more horsepower and torque in your Porsche 997 GT3 with these Fabspeed Muffler Bypass Pipes. Replaces the heavy, restrictive, factory side mufflers. Side muffler bypass pipes are made from T304SS, C.N.C mandrel bent, computer numerical controlled U.S.A. mandrel bending equipment. Side muffler bypass pipes work with factory headers and factory rear resonator. Fabspeed allows interchangeability between aftermarket and factory products with the use of V-Band clamps. Exotic sound with an aggressive edge, makes your 997 GT3/GT3RS sound like a CUP car. Complies with emissions and inspections.